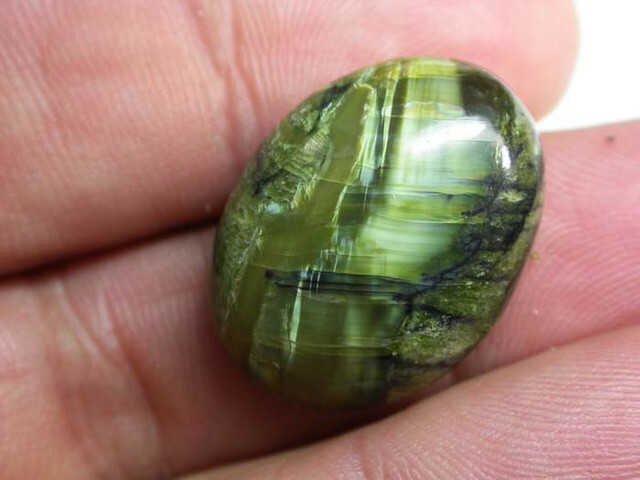 This is a green natural untreated stone from Brazil showing chatoyance [cats eye] effect.We have selected this piece as it has a strong cats eye effect. 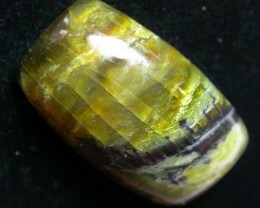 Chatoyancy or chatoyance, is an optical reflectance effect seen in certain gemstones Coined from the French “oeil de chat”, meaning “cat’s eye”, chatoyancy rises either from the fibrous structure of a material, as in tiger eye quartz, or from fibrous inclusions or cavities within the stone, as in cat’s eye chrysoberyl The effect can be likened to the sheen off a spool of silk: the luminous streak of reflected light is always perpendicular to the direction of the fibres. 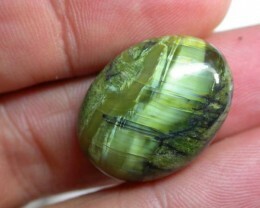 For a gemstone to show this effect best it must be cut cabochon, with the fibers or fibrous structures parallel to the base of the finished stone. 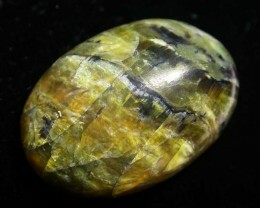 Faceted stones are less likely to show the effect well. 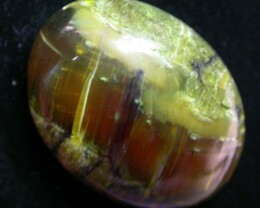 Cats Eye Opal was formed app 15 to 30 million years ago, during the tertiary period. Starting out as a liquid it seeped through sedimentary layers of earth, settling within impervious clays at a depth of 20 to 30 metres. 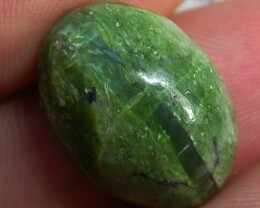 Over the coarse of millions of years, the liquid slurry crystalized, becoming catseye opal. 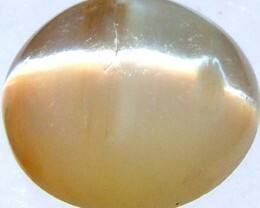 Cats-Eye Opalite is a rare chatoyant form of Opal. 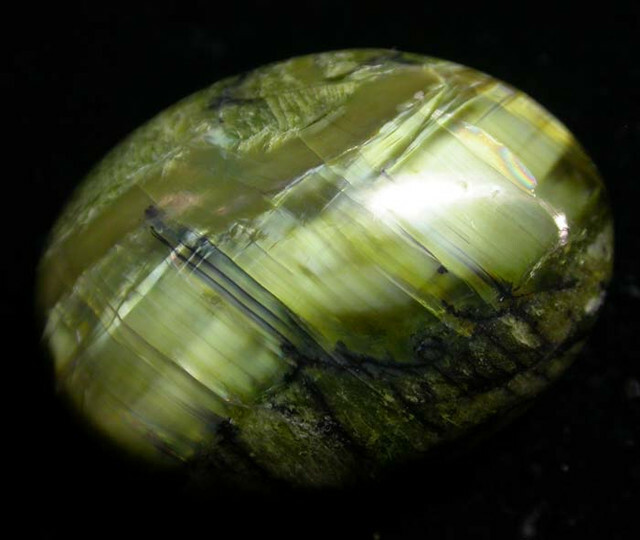 The attribute that gives this stone its popularity and name is the phenomena known as chatoyancy, also known in the gem trade as “the cat’s eye effect”. The reason for this fascinating phenomenon is very fine inclusions within the stone. When a light source is directed on these inclusions it creates a bright strip that appears and runs perpendicular to the inclusions. 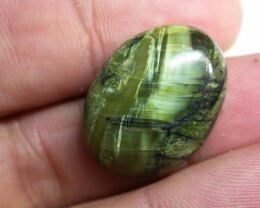 This strip will then glide across the surface of the stone when turned over. Opalite Cats Eye can also occur in shades of green yellow, red, white and black. 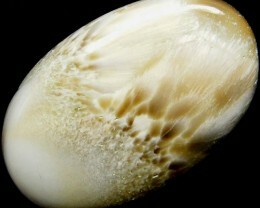 The physical structure of Opalite Cats Eye is unique. Tiny spheres of silicon dioxide form a pyramid shaped grid interspersed with water. Tiny natural faults in this grid cause the characteristic “play of color”. The effect is similar to the rainbow colors displayed on a soap bubble, only much more dramatic. 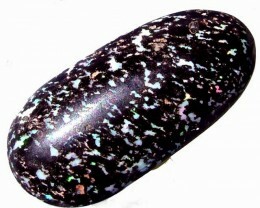 The incredible play of color is exhibited by the gemstone due to the presence of small spheres in the silica gel that causes interference and refraction appearance. 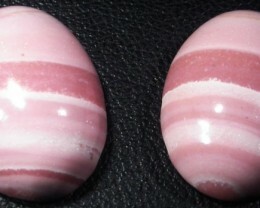 Silicon and oxygen chains are packed in the spheres and these are uneven in size and incoherent in concentration. 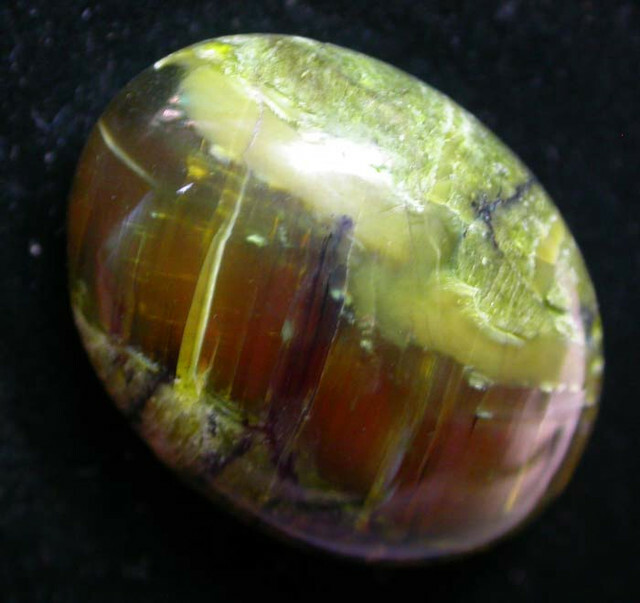 These are set in a compact structures thus, when ray of light falls it dissects the light on its way through the stone resulting in the awesome color play. 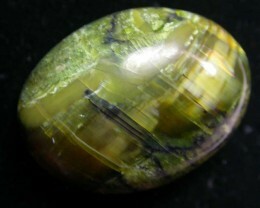 As per the size of the spheres within the structure, changeable colors of the gamut are diffracted. 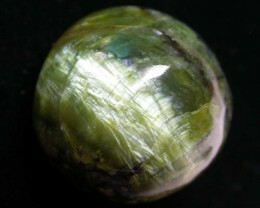 With the increase in the consistency of the spheres position, more intense and brilliant would be the color play.